The original building that once stood here was a traditional Roman Catholic Cathedral. It was during the Reformation that this new Baroque Lutheran design came to replace the old Catholic church. The new model was considered one of the best examples of Protestant architecture and it holds up one of the largest domes in all of Europe atop its octagonal base. 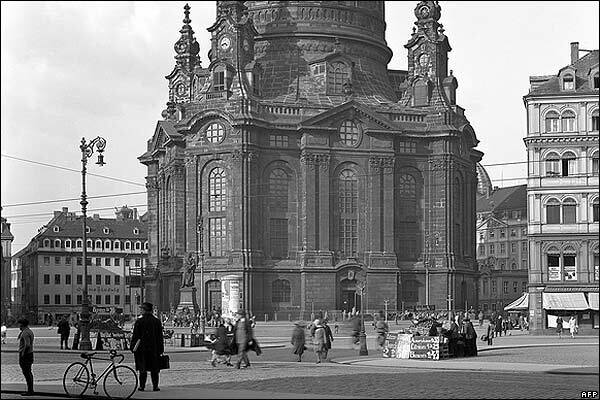 The dome and its golden cross was for decades the crowning glory of the Dresden skyline. 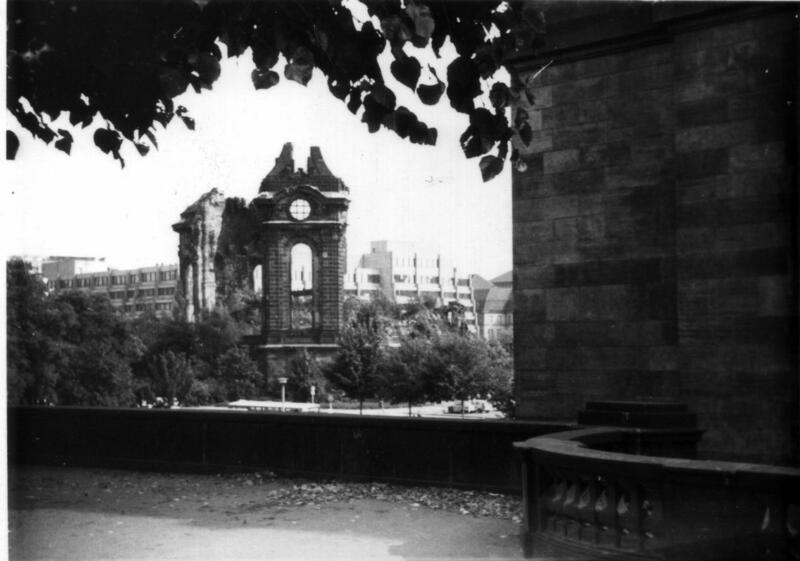 During WWII the church was heavily bombed. On February 13th, 1945, the American and British forces dropped thousands of bombs on Dresden. The church has withstood bombings and attacks before, but never to this extent. The church stood it's ground for two days of constant bombing runs. People had come to the church to seek refuge and for those two days, the eight massive sandstone pillars protected these people, and no doubt saved their lives. But, even the strongest must fall. And after 650,000 bombs the heat that was generated inside and outside the church cause the pillars inside to explode. Some claim that they glowed bright red and then shattered into a million pieces. After the war was over, people who had loved their church so, took the pieces of shattered and blackened sandstones piled them together. They collected these pieces in the hope that one day their former heart of the city would be rebuilt. But they had to wait over 45 years, through communism, until their church would return to the people. The communists had no interest in spending money to reconstruct the church, but dedicated art historians, priests and even just the congregation began salvaging and categorising the stones.These stones became a memorial to those lost at war and in 1982 it was the place where people would meet to protests the East German regime. Finally, after reunification, the reconstruction of the church would begin. In 1989, a 14-member group of enthusiasts headed by Ludwig Güttler, a noted Dresden musician, formed a Citizens' Initiative to raise money for the restoration. Architecture, art historians and engineers sorted the thousands of stones, identifying and labelling each for reuse in the new structure. An American Günter Blobel, had fond memories of the church when he was a boy as he had originally been born in Germany before moving to America. In 1994 he won the Nobel prize and donated his $1 million prizes to the Dresden Church of our Lady resolution. In the end, the rebuilding of the church cost €180 million dollars, most of which was raised by private citizens. Outside the front doors of the church lie an original piece of the dome, blackened from the explosion as a memorial to the original church and those who died trying to protect it. To this day, you can stand outside the church and see the original piece of stone that have been used in the church's restoration. These stones are covered with a darker patina, due to the fire and weathering, but in a few more hundred year, the rest of these new sandstones will also become weathered and blend into the original stones. It was a sight to see as it is, making out the immensity of stones that were salvaged by everyday citizens. To me, the most moving piece of restoration is the new golden tower cross. The cross was funded by "the British people and the House of Windsor" and was made by a British blacksmith whose father was one of the bomber pilots who were responsible for the destruction of the church. It shows how two countries once at war, can come together to help repair the scars of war, and create something beautiful once more. The original Baroque Church was built between 1726 and 1743 by Dresden's city architect, George Bähr. The church is bright and covered from head to toe in pastel colours. When restoring the church, artists used paintings and photographs of the original colouring to restore it to its former brilliance. Some people might not believe that these colours could have been utilised in the 17th century, but the Baroque architecture was obsessed with pastel colours. Bähr especially loved green and gold and accented the church with these trimmings. The windows are made of clear glass, and although this might look like an oversight or work in progress from the restoration, it is actually on purpose. The architect wanted the pure sunlight to filter through the windows, unheeded by stained glass, to illuminate the inside of the church further. Bähr made sure to incorporate the new Protestant liturgy by placing the altar, pulpit, and baptismal font right up front for all to see. He made the front middle section of the church the real stunner and left the rest of the church to only compliment this glowing altarpiece and organ. One important aspect of Baroque architecture was the element of illusion. As such, a church that couldn't afford hundreds of slabs of marble created their own by painting marbling patterns along all the sandstones columns which hold up the immense dome. The Baroque painters and architects are masters of light and shade and using this can create illusions that make the building seem longer, wider and even more detailed. In 1736, famed organ maker Gottfried Silbermann built this incredible three storeys manual organ for the church. On the day it was inaugurated into the church, Johann Sebastian Bach performed a recital to an audience of hundreds. One can only imagine the kind of music he would have produced out of this grandiose machine. Below the organ, you can see, well how can you miss, the large altar. This altar depicts Jesus’ agony in the Garden of Gethsemane. You can see the olive trees behind him, and the see him praying to the angel coming down from heaven, accented in gold. 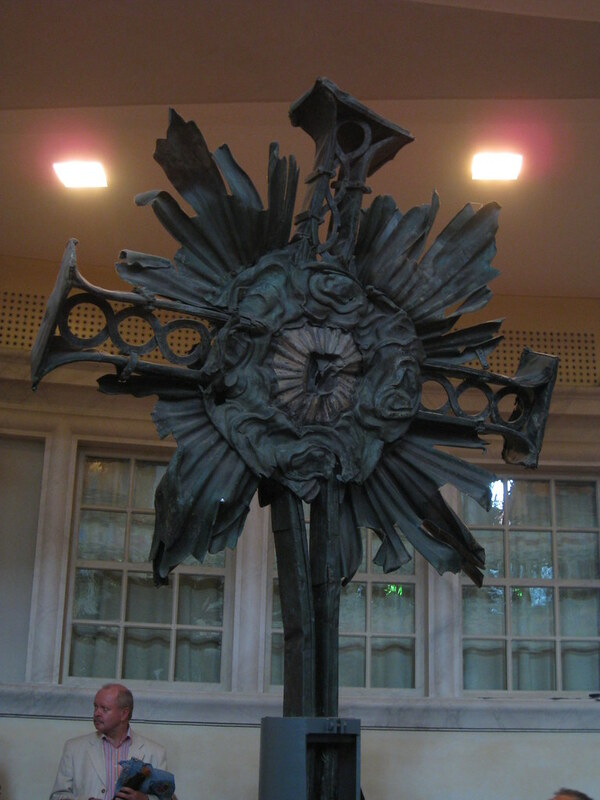 By some miracle, this piece partly survived the bombing and the fire that destroyed the church. Some of the figurines had pieces broken off but were more easily restored leaving us today a real original piece of the church. Other than the altarpiece, the most important part of this building in the 96-metre tall dome. The name of the dome is "die Steinerne Glocke" or "Stone Bell". At the time, it was a real feat of engineering and required 12,000 tonnes of sandstone to support. The frescos painted around the dome are scenes of the four evangelists Matthew, Mark, Luke and John, and allegories of the Christian virtues of belief, love, hope and mercy. These baroque frescos are painted with lighter hands; they were meant to reflect not only the lives of the evangelists but the lives of the ordinary people. The scenes are set on earth and seem more related to people. You can see many of the details on the wall frescos and the dome by ceiling up to the top of the dome. This requires an entry fee but is perhaps one of the best views of the city and also of the church itself. The winding and spiralling staircase leads you to a tiny trapdoor which you climb through to suddenly come through to a viewing platform with a stunning view of the city. From here you have a 360° view across the Elbe and Dresden. We were up there on a clear day, and we could see all the way to the past the city, and over the countryside which surrounds it. From here you can see the Dresden Academy of Fine Arts and Brühl's Terrace. Around the corner, you can see the central historic district. You can see the pointed spire of the Dresden Castle, the green onion down of the Roman Catholic Church, the Orange roofs of the Dresden State Art Collections, and the Glass roof of the Dresden Green Vault. Looking down you can see the newly restored square and all the little dots of people down below. During the restoration and after the war this square was where they stored all the thousands of pieces of rubble, now that the construction is done, the square has opened back up to the public - and they have been greatly enjoying having it back. As well as their stunning church which anchors the centre of the city.